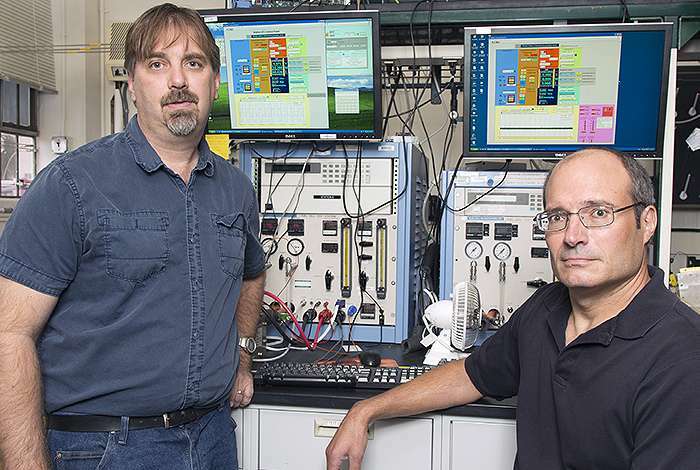 Rod Borup (left) and David Langlois simulate drive cycles on a fuel cell test station at Los Alamos National Laboratory to understand how carbon corrosion affects catalyst stability. Balancing durability and cost is a key challenge for the success of hydrogen-powered electric cars. Los Alamos National Laboratory is leading a Department of Energy- Fuel Cells Technologies Office-funded project to enhance the performance and durability of polymer electrolyte membrane (PEM) fuel cells, while simultaneously reducing their cost. "The cost and durability of current PEM fuel cells is a major barrier to their commercial use for stationary or transportation power generation," said Rod Borup, director for the five-institution fuel cell consortium. "By bringing together the proven expertise in our consortium laboratories and building on our existing capabilities, we plan to demonstrate world-class improvements exceeding the 2020 targets set by DOE." The PEM fuel cells produce electricity through the reaction of hydrogen and oxygen—their only emission being the water formed when the proton and electrons combine with the oxygen. Today is National Hydrogen and Fuel Cell Day, dedicated to increasing awareness of this renewable energy technology. The date, October 8, is a nod to hydrogen's atomic mass, 1.008. Fuel cell technologies can significantly benefit the nation's energy security, the environment and economy—offering reduced oil consumption and highly reliable grid-support, reduced greenhouse gas emissions and air pollution and expanded renewable power use and highly efficient conversion. While PEM fuel cells are deployed in demonstration vehicles and are beginning limited commercialization, they still fall short of DOE targets for this technology, which are required for widespread consumer acceptance. Consortium members in this effort are Argonne National Laboratory, Lawrence Berkeley National Laboratory with Adam Weber serving as the consortium's deputy director, Los Alamos National Laboratory, the National Renewable Energy Laboratory and Oak Ridge National Laboratory. The consortium will coordinate national laboratory activities related to fuel cell performance and durability, provide technical expertise, and integrate activities with industrial developers. The consortium will serve as a resource that amplifies DOE's Office of Energy Efficiency and Renewable Energy's Fuel Cells Technologies Office impact by leveraging the core capabilities of the multiple member Laboratories. Dimitrios Papageorgopoulos, the Fuels Cells program manager, will lead the consortium. In addition to leading the overall project, Los Alamos will coordinate the evaluation of membrane electrode assembly's performance and durability using the Laboratory's wealth of fuel cell expertise and materials characterization tools, with Los Alamos scientist Rangachary Mukundan as thrust coordinator. I wonder if the new system touted by GE can integrate this into it? They are the first I have noticed who "get it", as far as the master technology to integrate inputs of alternative energy systems.